Once in a while, we get sushi cravings and yesterday evening was one of those times. 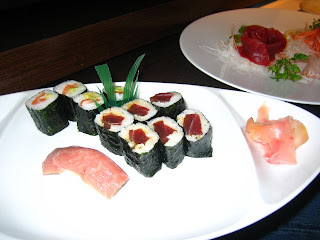 Finding an authentic sushi restaurant in Marbella is not that easy despite the proximity of the sea and the variety of fresh fish in the market. We used to go to Katsura but that closed late last year after the sushi chef/owner passed away and has remained boarded up since. So, we decided to go to TARO at the Guadalpin Hotel. The reviews have been mixed but they do have a Japanese chef so we thought why not give it a try. We had booked a table but upon arrival decided to sit at the sushi bar instead to be closer to the action. 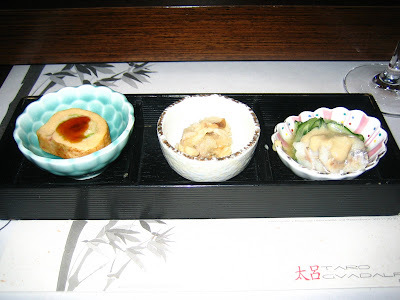 Once seated, we were given a complimentary starter of three small dishes – one of mackerel in vinegar with thinly-sliced cucumbers, another of mushrooms and a Japanese-style fish omelet. We got our miso soups next which was flavored with seaweed and enoki mushrooms. This was followed by our order of assorted sashimi of tuna, salmon and sea bass, some salmon-avocado rolls, spicy tuna rolls and nigiri sushi of toro (tuna belly). 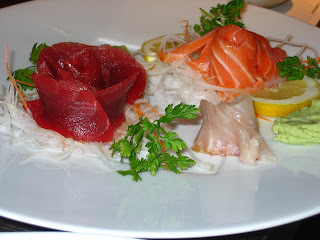 The sashimi was served simply and the fish was fresh. The rolls were very good but the star of the show was the toro sushi which was a slice of fresh raw tuna belly on sweet vinegary rice that melted in the mouth. Prawn and vegetable tempura came next which was five large prawns and a few vegetable pieces in tempura batter and deep-fried. Tempura is easy to make but tricky to do perfectly – the secret is to use ice-cold water mixed into the flour and not to stir too much or the batter becomes soggy. Taro’s tempura were flavorful but unfortunately soggy – it lacked the crunch it should have had. Chicken Teriyaki came last and was gooey like the chicken was coated in flour before being grilled. The Teriyaki sauce was nothing exceptional and the accompanying fried rice was a letdown. TARO Guadalpin should expand their sushi offering since it’s what they do best to what they do best plus improve on the few hot dishes they have on the menu. Open Tuesday to Sunday for dinner from 8 to 11 p.m.
My advice: Sit at the bar, have some sushi and sake and then if you’re still hungry, have your main course elsewhere.